Miss 11 tells me she'd like one just like it and I think she's very tempted to try to squeeze into this one....maybe I had better put it out of sight in case I find her stuck in it....lol. And I thought she was getting too big for cute little twirly dresses! Thanks to the lovely Melissa at Polka Dot Chair for her great tutorial which you can find here. 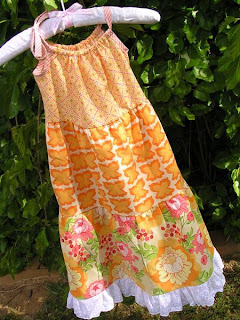 Beautiful dress, gorgeous bright fabrics. Congrats on getting some Christmas gifts made! Very sweet....and I'd still wear pig tails in my hair if it was long enough...Go for it Miss 11, you twirl girl!! Just beautiful fabrics Tracy. Wish my upper arms would allow me to wear pretty dresses like this too.